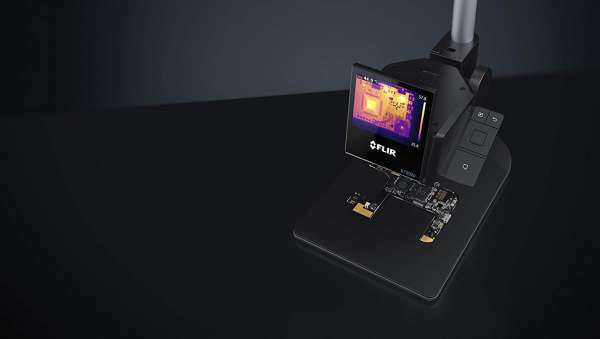 The FLIR ETS320 is the first true electronic test bench camera, designed for Quick temperature checks on PCB boards and electronic devices. The FLIR ETS320 is sensitive enough to detect subtle temperature differences with an accuracy of ±3°c, so you can quickly find hot spots and potential points of failure. The 320 × 240 infrared detector offers more than 76 000 points of temperature measurement, eliminating the guesswork of legacy measurement tools. Designed specifically for bench-top work, the battery-powered FLIR ETS320 connects to your pc for immediate analysis and sharing of thermal data. Product comes with camera, mount, stand, power supply, USB cable, and FLIR tools+ software. ensitive enough to detect temperature differences smaller than 0.06°C, for fast identification of faults and thermal gradients. Measurement accuracy of 2°c aids in attaining quality assurance and factory acceptance of printed circuit boards. Ergonomically designed for lab electronics measurement, the ETS320 is battery powered, Wireless, and hands free. With complete measurement and analysis on the camera, the ETS320 measures small components down to 150 µm per pixel spot size, from a minimum focus distance of 70mm. An alternative and cheaper solution to thermal imaging is the FLIR ONE PRO LT Thermal Imaging Camera attachment for smartphones. The all new FLIR One Pro LT gives you the power to find invisible problems faster than ever. Simply attach the FLIR ONE PRO LT to a supported Android phone/tablet with micro USB connector, and turn it into a powerful thermal imager with 4, 800 (80 x 60) resolution. With class-leading MSX technology that overlays visual image details into the thermal image plus VividIR image processing, the FLIR ONE PRO LT lets you see more details and get visual proof that you solved the problem right the first time. Whether you’re inspecting homes, cars, electrical panels, looking for HVAC problems, finding water damage, or having fun in the outdoors, the new FLIR ONE PRO LT is a tool No serious professional should be without.